as well as employee benefits. Recognized by Fortune magazine as one of the country's Most Admired Companies, Aetna is headquartered in Hartford, CT, with satellite offices in Blue Bell, PA and Middletown, CT.
Aetna's Middletown campus houses the company's impressive Computer Network Command Center (CNCC), which manages and monitors Aetna's Information Technology (IT) operations 24 hours a day, seven days a week, 365 days a year. 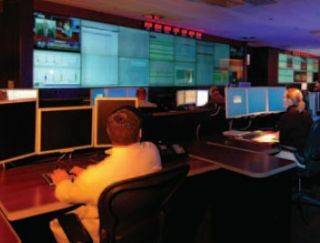 The facility is divided into three distinct areas - Network Operations, which oversees the company's Ethernet connectivity; Data Operations, which is responsible for maintaining applications, servers, and mainframes; and Mission Control, which coordinates and troubleshoots any significant quality of service (QoS) issues that may arise within the company's network and data operations. The CNCC has 152 employees that manage more than 56,000 desktop PCs, and over 1,000 server and mainframe computers across hundreds of Aetna offices worldwide. In addition to hardware components, they monitor more than 1,000 applications. "It monitors everything that could affect our financial stability in our business to ensure we have access to all of our applications and that our networks are solid," says Bob Reynolds, Aetna's senior integration command center specialist. In the beginning, the company had multiple groups monitoring systems in different locations, but they wanted to bring everyone together. "We wanted to integrate both the network and data application monitoring into one room and to have a central focus to resolve problems and reduce mean time for recovery," says Reynolds. In 1997, they made that vision a reality by creating the CNCC. Aetna collaborated with Constant Technologies, an AV system integrator based in Wickford, RI that specializes in command/control integration. They built out the entire facility from the ground up. The first iteration of the CNCC did not include any automation. For monitoring and display, they used 32 50-inch cathode ray tube (CRT) rear-projection screens, directly connected to 32 PCs. According to Reynolds, this did the job for a few years, but image burn-in and high support costs were problematic. There was no easy way to customize the displays or how images were viewed. In 2001, Reynolds decided to consolidate systems, reduce support cost, and find a better way to manage their devices. This time Constant Technologies installed 34 Clarity Systems WN-5230A-S Tigress LCD video cubes, which provide higher resolution with brighter picture quality and are less prone to burn-in issues than the old CRTs. In the CNCC conference/ videoconferencing room, they integrated four Clarity Wildcat 40-inch LCD cubes. For automation and control, they chose AMX's Axcent Pro system, which became a critical component of the CNCC. "A control system was essential for this facility because of the sheer number of sources and components it requires," says Ben Watkins, technology integration engineer for Constant Technologies. For controlling sources, they installed multiple 10- inch AMX AXD CV10 touchpanels. The last piece of the puzzle was a Jupiter Systems 8800 display wall controller. According to Dan Kment, Constant Technologies project manager, "This allowed individual computer images or programs to be scaled and moved freely from one monitor to another or across an entire group of monitors as one large display area." This unit was controlled by the AMX system as well. "Without an AMX interface to the display wall processor, this would be a tedious, time consuming task for Reynolds and his staff," adds Watkins. In 2003 they choose to upgrade their hardware once again. This time they moved to the AMX NetLinx ME260/64 system. This allowed for more device support and included a web panel interface, which emulates the touchpanel from a computer browser. This feature is especially helpful for Reynolds when he travels, since he can monitor all devices from anywhere with an internet connection. In 2005, Constant Technologies integrated new touchpanels, the 15-inch Modero NXT 1500 VG. Three of these panels are flush-mounted on the wall in the CNCC. They also purchased one wireless AMX MVP-8400 touchpanel. According to Watkins, there are some distinct advantages to using these panels, including a faster user interface, animated graphics, larger panel size, expanded feedback channels, and IP connectivity. The panel can also be accessed remotely through Virtual Network Computing (VNC) software. During this phase, they upgraded the Jupiter display wall controller and beefed up the display technology by replacing the existing video walls with 42 WN-5020-XP Planar Puma 50-inch LCD video cubes. Finally, Reynolds had Constant Technologies build and install 68 custom operator control consoles. The AMX system is especially valuable during times of crisis because it maximizes staff efficiency, enabling quicker resolutions. By selecting pre-programmed macros via the Modero touchpanel, the staff can execute a series of commands, such as dimming the lights, switching audio and video, and initiating a videoconference with just one touch. "It used to take Bob and his staff about an hour to set up a videoconference call and route it to the video wall. Now, this process now takes about two minutes," says Watkins. From the touchpanel, the staff can quickly preview, select, route, and display any source device in the room. The system also allows full control of their Lutron GRAFIK lighting system, Polycom video and audioconferencing equipment, cable television receivers, DVD players, VCRs, and the heating and air conditioning. Overall, 31 individual sources are controllable via the AMX and can be sent to 65 different output devices. "It's extremely important for the CNCC to integrate the most advanced technologies to ensure we receive immediate notification of any IT problem. Our sophisticated systems also provide the tools and resources needed to rapidly respond to and solve these problems," says Reynolds. With the hardware in place, Constant Technologies turned their attention to control system programming and touchpanel interface design. Watkins wrote almost 38,000 lines of code to integrate all of the components via the AMX control systems. "Today, the CNCC is really a showcase for Aetna," states Reynolds. "We conduct 80 to150 tours every year. When a current or prospective client visits, they see several large video walls displaying a multitude of information and staff members who can walk up to one of the touchpanels in the wall and make just about anything happen. I believe this provides a level of comfort to them, knowing the steps Aetna has taken to ensure our network and data are safe and secure." According to Reynolds, they plan to expand their control capabilities in the future. This will include greater control over their HVAC systems, security systems, and lighting to include areas external to the CNCC like their server rooms, all in an effort to continue to provide the best service and support to Aetna and their clients.